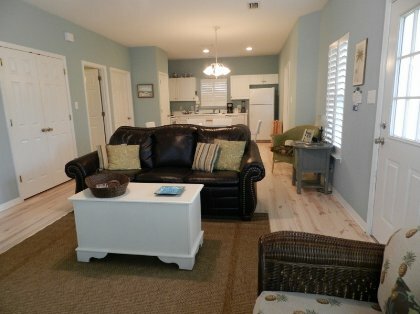 Cottages at the Rookery are located across the street from Gulf Shores beaches. It’s a 0.4 miles walk to the beach. 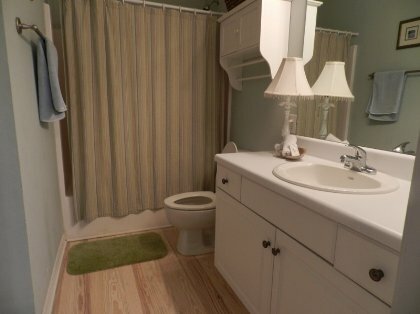 The development has a beautiful large pool and an outdoor Jacuzzi. The cottage has been decorated with care and love and will be clean and fresh when you arrive. 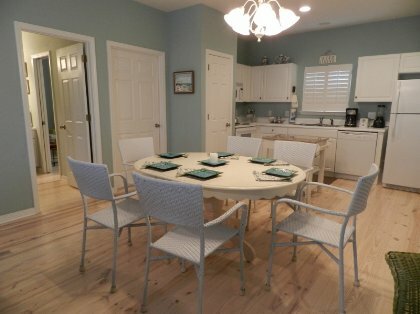 This is a perfect Gulf Shores vacation rental. It is located at mile marker 6, which is 17 miles down Fort Morgan Road from Gulf Shores. 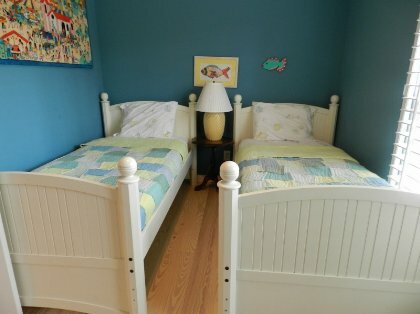 Two of the bedrooms feature queen size beds and the third bedroom has twin beds. The living room sofa makes a queen size bed. 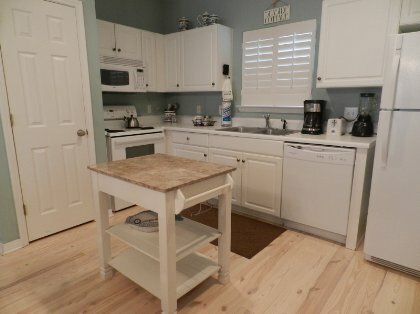 There is a full kitchen with microwave, dishwasher and ice maker. There is a washer and dryer. There is cable TV and wireless Internet. 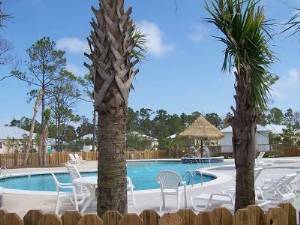 The Rookery was designed to be a natural and quiet resort and is located adjacent to the Bon Secour National Wildlife Refuge. 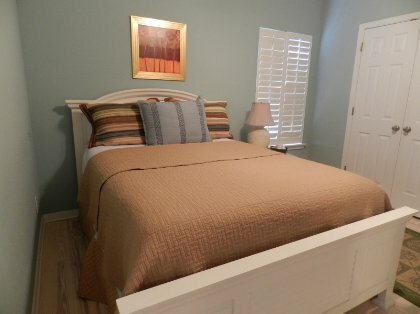 There are several golf courses near by and this unit is 17 miles from all the activities of Gulf Shores, but without any of the traffic, noise and construction after the hurricane. A marina, boat dock and restaurant are located nearby. Alabama’s Gulf Shores Coast offers a wonderful variety of inshore and offshore saltwater fishing. Go after elusive blue marlin, yellow fin tuna, amberjack, cobia, red snapper and more! Driving west from Gulf Shores along Fort Morgan Road brings you by scenic Bon Secour National Wildlife Refuge, a haven for nature lovers. You can find a secluded stretch of coast via a long boardwalk for easy wheelchair access. At the end of this peninsula, Fort Morgan stands guard to the mouth of Mobile Bay along with its sister, Fort Gaines on Dauphin Island, a ferry-ride away. Explore both forts and relive the Battle of Mobile Bay, where Confederate and Union forces fought for control of the Port City. While on Dauphin Island, be sure to visit the Dauphin Island Sea Lab. Parking is along side the unit’s boardwalk. There is a public park on the beach across the street and parking is along side the beach road. It is less than one half mile walk. A visit to Gulf Shores and Orange Beach offers the perfect balance of non-stop activity and lay-around-doing-nothing time. Putter around a bit on one of our championship golf courses. Cast your line for deep-sea adventure on a charter fishing trip. Travel back in history with a visit to Fort Morgan, the site of the Civil War Battle of Mobile Bay. Commune with Mother Nature as you hike through one of our Alabama wildlife areas and gaze at gators and shorebirds. My family really enjoyed this cottage and out of the fast pace of Gluf Shores but close enough for the enjoyment of restaurants and stores. The pool and jacuzzi is behind the cottage of which is very convenient and everything is clean. Very family oriented. We will stay there again if we go to Ft Morgan or Gulf Shores again. FALL rates are low,Aug 24-Oct 31..$110/night..$695/week..$1100/month Great monthly rates for SNOW BIRDS Children are welcome. There is a DVD player and satellite television, wireless Internet If you require special amenities that we do not offer, please ask us when you make your reservation and we will do our best to accommodate you. Rates are better for a full week.